Urban Hotbed supports creative citizen efforts and Business Improvement Districts by offering special discounts and consultation to the initiatives and their members. When it comes to public space development in times of tightening local authority budgets, more and more citizens and companies set out to take matters into their own hands, rather than relying on grants from non-existent public funding pots. Local residents volunteer in civic societies or neighbourhood associations, while businesses work to boost the appeal of their premises by forming Business Improvement Districts (BIDs) and committing their own funds to the economic development in their part of town. The London BID „Better Bankside“ , alongside the South Bank and the railway tracks, in a city center that has been undergoing major changes in recent years, represents a European role model for successfully promoting the results achieved. No endeavour spanning entire neighbourhoods can go without support from the local community (residents, businesses, visitors, customers, public authorities,…). That’s why it’s extremely important to start building inspirational momentum right from the start. Highly successful Business Improvement Districts and neighbourhood initiatives around the globe enable local communities to participate using project and neighbourhood websites which document the progress of their efforts. Larger city quarters promote tourist attractions both online and locally with specially trained on-site representatives providing information and assistance. Initiatives work to create memorable customer experiences within the BID, while local pubs and restaurants enjoy welcoming additional guests. Locals get inspired by resident get-togethers, as well as a vast range of business opportunities (such as networking events or dedicated job agencies). The positive business climate, in return, allows attractive benefits to be provided to employees of participating companies. In some towns neighbouring businesses also work with local authorities to improve the feeling of safety in their area. And the environment benefits from logistics plans for greener ways to supply goods to companies located within Business Improvement Districts. On the Urban Hotbed, we provide our clients with a wide range of tried and tested digital tools, from really simple-to-use surveys that can be answered within a couple of seconds on a smartphone screen, through to punchy and visually appealing maps that showcase progress to all participants and stakeholders. More life for your neighbourhood. Order here. Loyalty cards have long since become a proven tool when it comes to handing out rewards to specific target groups. No later than 2012 iPhone inventor Apple readily pushed loyalty cards – until then mostly made of cardboard or plastics – into 21st century as digital “passes”. For more than two years now, we’ve been developing complementary digital infrastructure, known as the Urban HotCard Service on the Urban Hotbed: ready to be deployed by medium and small-sized businesses all over the region. Right here and now, you can download our free consulting voucher directly to your mobile. Easy and convenient handling at its best ‒ experience it for yourself. 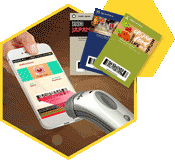 Use your smartphone to scan the QR code on the voucher as displayed. Optionally: Download the voucher file to your computer first and then send it to your mobile by e-mail. all free ‒ no additional app required !! Give it a try right now !! Learn how to successfully advertise your business with coupons using our special guide for Food & Hospitality !! Trust in your customers and fellow campaigners to feed you their needs and local requirements using their smartphones or optimized forms, which ‐ without any effort at all on your part ‐ streamline all processing activities and never leave you in doubt about the current status of a project. Add the visualization power of our upcoming map tools, along with the empowerment and appreciation experienced by stakeholders and local employees who use the Urban e-Ticket, and you’ll soon be able to lead additional sales to all local businesses by offering true incentives which really resonate with your audience.